The tunnel arrived! We had a solid thirty minutes of fun then needed something else to do. Will, Evan and Lily managed to pry open David's closet - voila! instant fun. We played with all David's shoes for another good thirty minutes before I got tired of putting them back in the closet while the babies flung them out and closed the closet. Party over. The grandmas can't arrive soon enough, surely they will have some ideas on fun things to do. Evan signed 'more' today at Pacha for Sarah. She was doling out bits of muffin to the trio and her son Camden while I was ordering our iced lattes. When asked, "Who wants more?" Evan signed 'more'. He did it several times. We were both surprised. I guess the signing we have been doing is beginning to sink in. I think it is a fabulous idea to immerse children in a language as early as possible, and there is no research that shows it is detrimental. Multiples can be delayed but often they communicate effectively with each other in their 'own' language. If you start to see them get frustrated simple baby sign is a way to help. Keep me posted! Wow, almost 1 year old...I am so glad they are doing well. Can't wait for the new play tunnel I ordered to get here. I'm running out of ideas to entertain these babies. Maybe it's just me but I think we are getting stir crazy in this house. They have so much fun when we get out. It's time to start taking them to Gymboree or music class and more playdates. They enjoy playing in the yard, but even David and I both can't keep up with the three of them. The divide and GO, and want to put everything into their mouth. I have already fished out several acorns from tiny mouths. The squirrels are starting to get irritated. Nanny #4 We found another terrific nanny who speaks English but no Spanish. The babies really enjoyed her. It's a difficult decision to make but we are leaning towards hiring nanny #1 for the bulk of the time. She is working for us this week. Nanny #1 is great with the babies AND has the energy and resourcefulness to keep our household running smoothly. We have the laundry machine and dishwasher running all day. We are constantly picking up bottles and toys and cleaning the floors. If the nanny doesn't pitch in, I am doing it while the nanny plays with the babies. 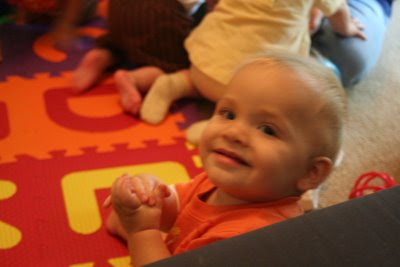 We also still haven't given up on the idea of exposing our babies to both English and Spanish. I think speaking at least two languages is going to be increasingly important in our global society. Bilingual babies appear to have a bit of a language delay but once they start talking they speak both languages well and catch up. I don't know if being a triplet compounds the delay though. 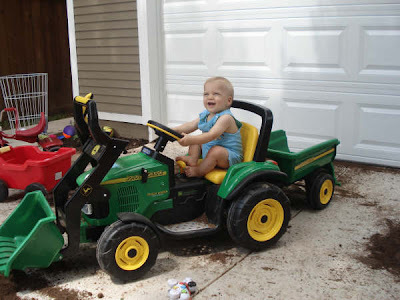 I'm going to give our developmental therapist a call today. We would still like to hire nanny #4 for ten hours a week (if she will accept that offer). She wants a full time job but may be able to work out two part time positions. I hope so! Would love to have them both. 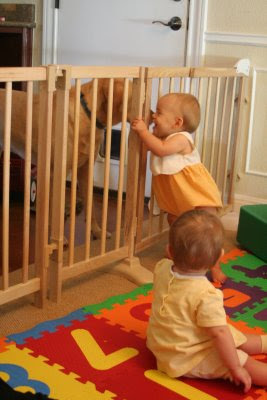 We feel lucky that both these nannies have a strong rapport with the babies already. I guess good nannies love babies, and they can feel that. We've been on the birthday party circuit lately. Last weekend Will and I went to Max's first birthday party. Yesterday Evan and I went to Jack's second birthday party. 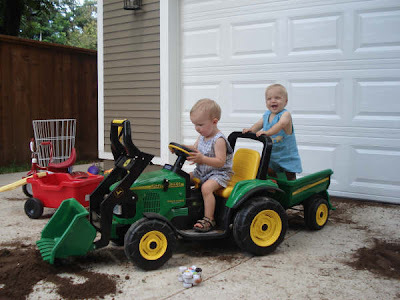 It was a truck themed party and they had trucks of all sizes and a big pile of dirt to play on - cool! I'm making mental notes of all these great party ideas for later. Evan taking a turn driving. Before we had children, I always wondered who would be the heavy – me or David? So far, it looks like David. I let the kids do things that he finds totally unacceptable, like looking into the refrigerator for a few minutes while I check my blogmates daily entries. I figure I’m wasting a bit of energy, but I’m also fostering their curiosity. Well, today while I was reading about a fellow triplet mom and an unfortunate Sharpie magic marker incident I looked over to discover this. Did I mention our housekeeper Isabel just came. She left maybe an hour ago leaving us with a spotless house. I’m glad she is not here to see this violation to her clean floors. Lily walked today - twelve steps! She started walking across the kitchen, took a few steps, wobbled a bit, regained her balance and kept going. I counted them off as she went. My mom said I walked at ten months. I didn't believe her at first but I guess it's possible, Lily turned eleven months this weekend - ten if you adjust her age for her early birth. I made blueberry muffins tonight after work. Did you know it was possible for three eleven month olds to polish off a blueberry muffin in less than ten seconds?...after having dinner none the less. They ended up eating two. I must make good muffins. Here is Lily sitting on the sofa. It is funny how she crawls up, sits and then leans way back trying imitate us. We had a playdate with three sets of twins at Jenny's house today. Nine babies, but it was surprisingly harmonious. Lucy was fond of Lily, giving her lots of kisses while Lily was giggling away. 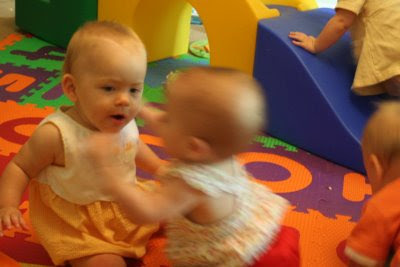 The kisses became hugs and progressed to tackles before the playdate was over but everyone was having a good time. Here are some action photos Jenny captured and posted on Harper and Lucy's blog. As Jenny says 'love hurts'. Lily looking for Murdoch. Evan, Wilson and Lucy in the background. Evan and Lily loved Murdoch. Should we get a dog? 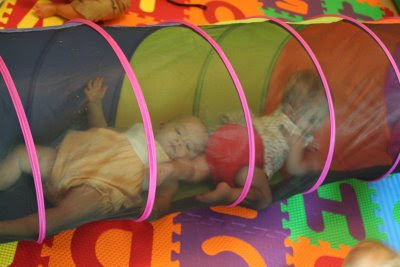 I'm definitely ordering a tunnel like this one, worth hours of entertainment. This mornng Will grabbed Lily's paci from her and put it his mouth. I was wondering if I should interfere or let them work it out when Lily grabbed it back and put it back in her mouth. Then Will grabbed it back again. At that point I was not sure who to tell 'no, that's so and so's paci' so I swapped Will another toy for the paci and handed it back to Lily. No one seemed too disturbed by the transgressions. They are eleven months old. I'm not sure how much I should mediate when they are playing at this point. I've been focusing more on 'be gentle' 'don't pull hair/poke eye/hit' when they get overzealous with their affection of each other. Feel free to share any toddler discipline tips or book ideas. We tried to have a somewhat lazy Sunday today and have some fun with our trio. David had the great idea to take off all the cushions off the couch and built a fort. They loved being able to easily climb on the couch and play with Dad in the fort. They have endless energy and spend plenty of time 'walking' with our help these days or pushing each other around in their wagon. We also got a visit from Grandpa, they climbed all over him too. It's hot and humid. It feels hotter than the forecast below. 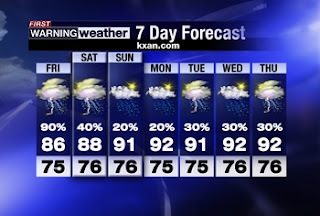 We had a dry spell for a week but now more rain with hurricane season starting up. This is the time of year where I seriously consider moving away from Texas to someplace cooler. I am counting down the days until fall when we can head out to the park with out sweltering. Nanny #2 came today. She called at 10am today saying she couldn't make it at 11am because she needed to take her daughter to get her driver's license. She said she would come at noon, then arrived at 12:20. Not a sterling start. She was sweet but just not that terribly helpful *sigh*. Marah is coming this afternoon to help with the dinner, bath, bottle, book bedtime routine 'Bed, Bath and Beyond' as someone called it the other day. It's nice to have help in the evening- thats our busiest time of day. Then David and I are headed to an early dinner to be home by 8:30. Marah is fantastic with the babies and has a ton of energy, but she is already a full time nanny to adorable triplet toddler girls. They are out of town this week - lucky us. Our search for a new nanny has brought up a lot of emotions. I've started second guessing working part time and being away from my babies. Losing our nanny shook me a bit, I thought she was committed. Even though I have a strong trust in her I started to question my beliefs. I also know several stay at home moms (SAHM) who have very little help if any and have incredible energy for their children. They inspire me to spend more time with my children and have less help. To be a working mom or stay at home mom is a divisive issue. If you go to work, there is often an underlying judgement that you are selfish and love your children less than the stay at home moms. If you don't work you are 'just' staying at home and some say you may be giving up too much of yourself. Yesterday's Oprah show 'My Baby or My Job' took a closer look at exactly this question and was very enlightening. The gist of the show was that it doesn't matter whether you chose to work or not work. What matters is that you are attuned to yourself and your children and actively engaged in their life. So, if you need a job to feel vital and whole and in turn can give more to your children that may be the best decision for you AND your family. Or if you choose to stay home but can stay connnected instead of exhausted and checked out - that's great too. It's all about the connection we create and foster. I've found that for me, working three days a week helps me feel more energized for my babies and my husband. I still feel guilty that I work, and I realize I can't do it all but this is best for me and for my family, for now. I'm still in awe of the mom's I know that stay home and still manage to be actively engaged and highly attuned to their children. I hope that if I chose that path at some date I will able to be as strong as a mom as they are. Meanwhile I'm anxious to find the right person who I can trust to care for my babies while I am at work, someone who adores my babies. Mayela will be leaving to care for her new family in two weeks. As it turns out, she discovered the opportunity from another nanny in our own park and will be working just down the street! She will be caring for a five year old with mild Autism, and his baby sibling due January. Kiss goodbye, before I head to the office this morning. Nanny #1 worked with us on Saturday, she is the one who has worked for four years for a family in the neighborhood. They are moving to Houston in one week. She was great with the babies and I got a positive vibe about her. She is a hard worker, during their nap she took care of the basic baby chores then took the initiative to mop the floor and vacuum so that the babies would have a clean floor to crawl on! Down side, she doesn't speak English. I was a bit tuckered after speaking Spanish for a few hours. My Spanish is significantly lacking but we could communicate. I have some concerns about potential misunderstandings. Nanny #2 interviewed on Monday afternoon. Again, a Spanish speaker but seemed to understand some English. She is not currently employed and I didn't get the feeling she had been a full time nanny recently. I believe she has worked for a girl who owns a local stationary shop. I need to give her a call and get a reference. She was sweet and nicely dressed, not ready to get on the floor with babies. She seemed a bit weary of caring for three babies, but excited about the pay and benefits. It was hard to read. I've invited her to work for us on Friday as a test run for the both of us. Nanny #3 has worked for a family nearby for the past eight years. She also only speaks Spanish. The children she cares for are starting school so she may be available full time soon. I'm trying to arrange for her to help us soon to see if she is a potential fit. Good news, my mom will be staying with us in September and Clare, David's mom will also be back from Colorado. 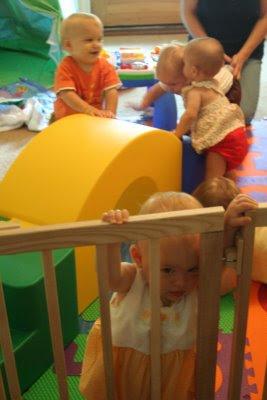 So, as the babies get to know a new nanny, and she learns our routine, there will be plenty of help. I plan on working from home the last week of August to close the gap. Let me know your thoughts on being a stay at home mom versus balancing a profession and motherhood. What works for you? and how to you make it work? This morning I got Lily and Evan up and changed. I was finishing up when I heard Will wake and went to get him out of his crib. This is what Lily looked like when I returned. I must have gotten distracted and left the jar of Triple Paste out (which is, by the way, terrific for resolving bad diaper rash). The tears are because I took the jar away. I then realized this could actually be an emergency, and tried to assess how much she consumed. The jar says 'If swallowed, get medical help or contact a Poison Control Center right away.' So I called poison control (1.800.222.1222 if you ever need it) and talked to Doug. He assured me that she would be fine, you would need to ingest a lot of zinc oxide to cause any problems. They were so nice, even calling back later in the day to check on her just to be sure and sending us info. He said to call anytime, even 4am. David is hoping the zinc oxide will give Lily super powers. Perhaps Zog (zinc oxide girl) is impervious to the sun's harmful rays and has the ability to cure rashes with a single glance. A Finland study found an association between chocolate eating mothers and happy babies. In a study of 300 women, the babies born to woman who ate chocolate were more likely to smile and laugh. Another study by Dr. Odent found that among pregnant woman, chocolate was the most commonly craved food. He maintains that pregnant women instinctively know what foods their body needs which led him to take a closer look at chocolate. He found that chocolate is high in several important nutrients including magnesium, an important catalyst for fatty acid metabolism, critical for brain development. Dark chocolate with less additives yield the best health benefits. Add one more to that study. I ate dark chocolate throughout my pregnancy and we have three happy smiley babies (who also love watermelon). I'm also having some dark chocolate as I type, which bodes well for baby number four. On another note, everyone has been standing for moments at a time. A bit more ever day. I finally caught a snapshot of Lily standing today for almost ten seconds. The boys have even managed to take a couple quick steps before falling down the last couple days. Who do you think will walk first? I got a couple good nanny leads. We are trying out one on Saturday. She seems really sweet and I've seen her with her charges in the park. They always look happy. Don't worry, I'm not stealing her - the family she has worked for - for the past four years is moving to Houston in two weeks. One small problem, she doesn't speak english y no hablo espanol muy bien. Lily had her cardiologist appointment this morning. Great news, Dr. Wright concluded that Lily indeed has an innocent heart murmur. Nothing to worry about and no follow up appointments required. We even got some souviner pics from her EKG of her beautiful healthy heart. I also had my 16 week prenatal appointment and baby number four is big, healthy and definitely a boy. Baby moon was delightful. We had massages at the Watermark's serene spa, then spent the remainder of the day relaxing at the rooftop pool. Great service, they even refilled out waters while we were reading in the pool. We ventured out to dine at Azuca in S. Alamo where First Friday festivities were in full swing. The next day we tried to sleep in, but even the heavy block out drapes couldn't fool our highly trained internal baby tending clocks. We were both up at 7am laying there trying to go back to sleep. Finally David says, "You up, want to go get coffee." I was relieved he couldn't sleep either,"Yes, let's go!" So we headed out to Starbucks cand then back to our hotel for breakfast, then more napping and lounging until noon check out time. It was a quick trip but rejuvenating. And we both finished the latest Harry Potter book. Not so good news, our nanny Mayela told us today that she will be leaving us in a few weeks. Very dissapointing, she found a job for more money, one five year old. Hard to compete. We had a lot of luck with recommendations from the local triplet group I hope we can get some more good leads. Afternoon Playdate with darling Harper and Lucy. Here is Harper, Lucy and Lily pushing the wagon together. Team work makes the dream work girls. Here is a quick pic of our nudie cuties enjoying their new splash mat. And a goodnight photo, Grammy cornered by our trio at bedtime. They are just recovering from the playdate cold we caught on Monday (luckily a short one) and are chewing on their medicine syringes. A special treat for taking their medicine. Tomorrow David and I are headed off for a mini-babymoon. When we were expecting the triplets we took a babymoon to Hawaii for 10 days. Our room faced the ocean and we slept each night with the windows open and lulled to sleep by the crashing waves. This time we are a bit busier but we are managing to get away for one night. 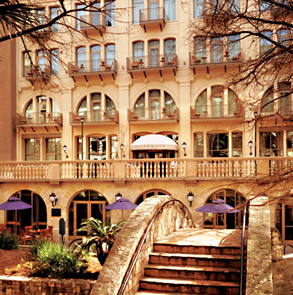 We are headed nearby to the Watermark Hotel & Spa in San Antonio. We will get up, have breakfast, then head to San Antonio in time for our massage appointments. Looking forward to a leisurely day with no responsibilities and sleeping in for the first time, in a very long time. Thanks Mayella, Papa and Grammy for helping out while we are away.